Engineers earn top dollar, but students majoring in other STEM fields can also nab a healthy paycheck. Earning a degree in science, technology, engineering and math, known as the STEM fields is a good way to earn a higher salary after graduating from college – especially with engineering specialties. 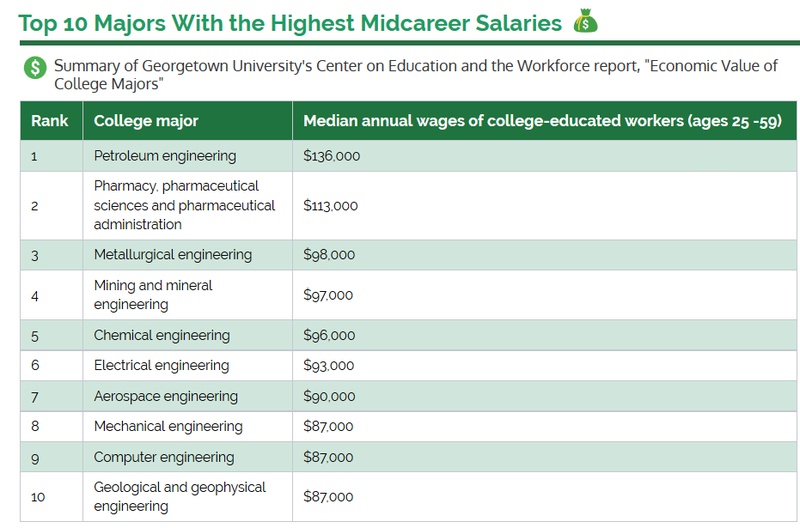 Those majoring in petroleum engineering earn the highest mid-career salary at $136,000 annually, according to the report “Economic Value of College Majors” released by Georgetown University’s Center on Education and the Workforce. Economists say that pay in the STEM fields keeps growing while salaries in teaching and social services careers remain stagnant. The typical college grad will make around $33,000 for an early career salary, and that increases to around $61,000 over time for a bachelor’s degree holder, according to the report. A degree in petroleum engineering pays $4.8 million over a graduate’s career compared with early childhood education, which pays $1.4 million, the center finds. “For earning a higher salary, you want to be tied to the lifeblood of the economy, which is still oil. And the other one is to be connected to money, which is Wall Street,” says Anthony Carnevale, the center’s director. Here are the center’s top 10 majors for nabbing a higher salary. Engineering majors: The unemployment rate for engineers and scientists is relatively lower than other fields at 3.8 percent, compared with 8.1 percent for the general population, according to the National Science Foundation, which tracks science and engineering employment. “You have a limited supply who graduate in these majors – they’re very tough programs and they weed a lot of people out,” says Katie Bardaro, lead economist at PayScale, an online salary and compensation information company. Engineering concentrations such as petroleum, chemistry or mining also pay well because these fields are tied to technology and play a crucial role in the economy, Carnevale says. Experts say these fields are so specialized, the earning power starts with a bachelor’s degree and a graduate degree isn’t needed unless it’s to pursue another career path such as teaching at a university. According to data collected by the center, the mid-career annual salary for a college grad has fallen by 11 percent in recent years, from $98,000 to $87,000. “There are more people who major in computer sciences than in those heavily in-demand engineering fields,” Bardaro says. Economists say there is also a wider spread among salaries for grads who major in computer science. The typical annual salary for a software architect is around $117,000, compared with a front-end developer, who makes around $89,000, according to Indeed, an employment-related search engine. Despite a dip in wages, the demand for graduates with majors in computer science and engineering remains strong, experts say. “We’re continuing to see growing demand for highly skilled employees with a background in any of the computer science and engineering disciplines,” says Terence Chiu, vice president at Indeed. Other degrees: Only 20 percent of the college workforce majored in a STEM field such as engineering or mathematics, the center finds in its 2015 report. “The takeaway shouldn’t be ‘Everyone choose a STEM major’ because that’s not reality for everyone,” says Bardaro. The most popular major in college is a business degree, according to the Department of Education. But wages for this major vary widely, ranging from $43,000 to $98,000 annually, the 2015 report finds. Bardaro says the disparity in earnings for a business major varies based on the specialty. A college graduate studying finance is likely to earn more than a business management major because it requires analysis and mathematics. Students not interested in a STEM field should consider taking a class in entry-level statistics or economics to boost analytical skills and appeal to the skill-gap shortage in the job market, Bardaro says. College degrees that remain at the bottom of salary reports, she says, are usually majors that bring a societal benefit, such as education, religious studies or parks and recreation. “If these are fields where you’re interested, make sure that you don’t go to an expensive private school. Go to an in-state public school, so the undue debt burden is lower,” Bardaro says.